"Approved military families" will see their adoption fees waived over Memorial Day Weekend, at the Helen Woodward Animal Center. PAYING RESPECT... and honoring those who have served on Memorial Day Weekend may be done in numerous ways, from attending a parade to visiting a site rife with historical import to thanking a veteran. But sometimes organizations that aren't necessarily historic landmarks or associated with the observance want to find a way to also commemorate the occasion, and do so in a way with meaning, emotion, and a long glance at the future. 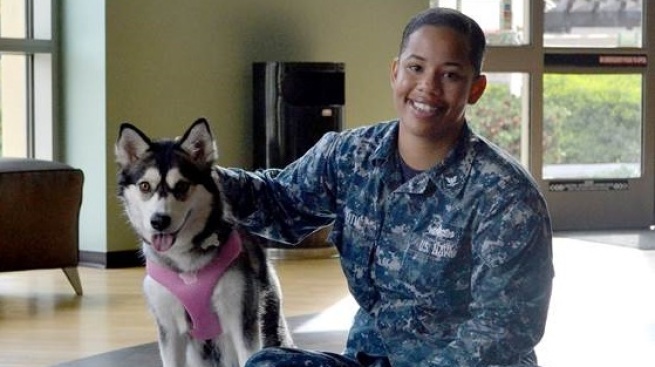 The Helen Woodward Animal Center in Rancho Santa Fe will be doing just that from Friday, May 26 through Monday, May 29 through a kind-of-heart promotion called Animals for Armed Forces Weekend. "PATRIOTIC PAWS SALUTE THE U.S. MILITARY" is the theme behind the drive, which hopes to pair up "orphan animals with United States military heroes!" The Animals for Armed Forces Foundation is a partner with the Woodward on the four-day happening, a happening that will see adoption fees waived for "approved military families" hoping to welcome a new furry sweetheart into their lives. A message of gratitude is at the heart of the weekend, with the knowledge that the "...unconditional love of a pet provides years of comfort, laughter, joy, and devotion — crucial elements to assist military members and their families whose lives have been dedicated to dangerous careers and necessary bravery." THE CENTER's... ongoing Pet Encounter Therapy program brings therapeutic animals into the lives of some 60 to 70 veterans a month. So even if you and your family choose not to adopt over Memorial Day Weekend, you can support the organization in its role of supporting those who serve in numerous, animal-sweet ways.